You step out of a small shop and into the bustling streets. A mob of people are traversing the marketplace around you. The noise and constant pushing and shoving is nearly unbearable. You glance about to see what shops are in the vicinity. The merchants are selling everything you need to purchase so you decide to press through the crowd before it gets any busier. This page lists the items Brett DeWald is currently offering for sale. Most of the items for sale usually include painted miniatures, scratch built wargames terrain, and other artistic items. Most items are from a fantasy or science fiction genre. He has won 26 Golden Demon awards in North America as of July 2005. If you would like to commission Brett to paint a figure then click this link to send him your request via email. Please include your name and the description of the figure you'd like to have painted. A response will be sent as soon as possible. Click an image to see larger images. Thank you for your interest! The vampire continues it's grotesque habits. It works in secret, but is eventually discovered. A holy man confronts the evil creature, intent upon its destruction. Evil lurks in the dark, but all is eventually revealed in wholesome light. This vampire's reign of terror has reached an end. 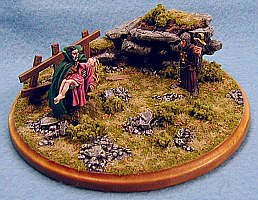 This unique diorama was assembled and painted by Brett DeWald. The base has been stained, varnished, signed and dated. Felt circles have been attached to the base to prevent damage to surfaces underneath the diorama. This one of a kind creation includes a certificate of authenticity and is 4 1/2" diameter x 1 1/2" tall. Click the image to the left to view more pictures. I accept Paypal, Money Orders, and Personal Checks. To ask a question about this figure or to purchase the figure, please send an email. This metal limited edition miniature was given to attendees of the 2005 US Games Day. It was been produced by Games Workshop and has been painted by Brett DeWald. The color scheme matches the Ultramarines Space Marine Chapter. 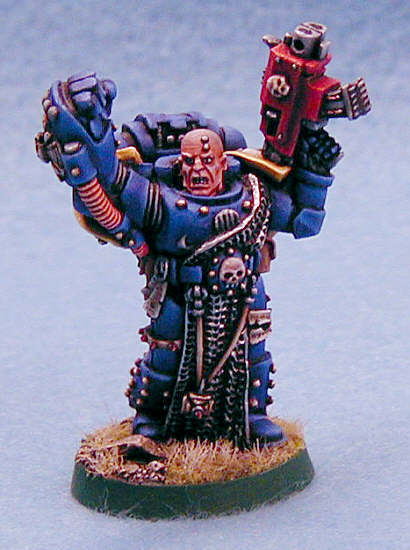 He would make an excellent addition to a collectors display or may be used in games of Warhammer 40,000. I accept Paypal, Money Orders, and Personal Checks. To ask a question about this figure or to purchase the figure, please send an email.